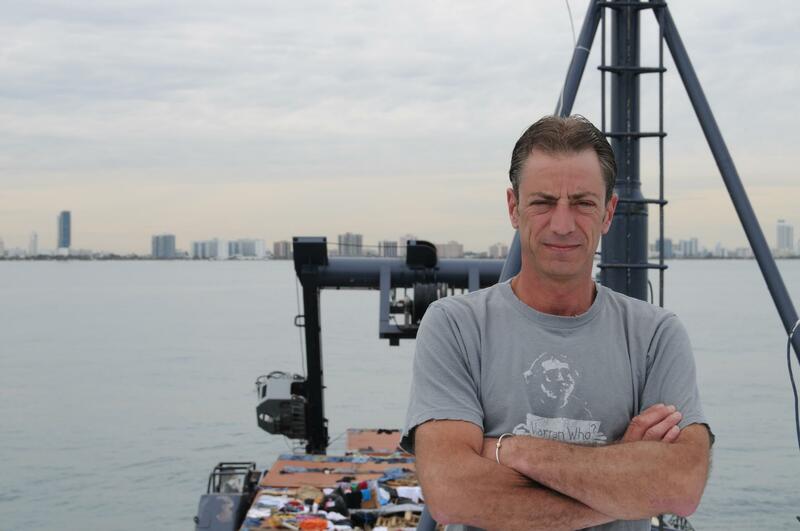 Gary Esper is the Captain aboard the M/V Sea Hunter, Sub Sea Research’s 220′ research vessel. He is an integral part of the team and a leader in the Port Nicholson recovery effort. Find out how he got his start with the company, and what his daily job consists of. Gary began working for Sub Sea in 1998. He has been a diver for many years, and was diving off the coast of Massachusetts with a friend when they discovered a number of spikes belonging to the wreck the USS New Hampshire. Gary’s friend got in contact with Greg Brooks of Sub Sea Research, who purchased the spikes from them. After this initial meeting, Sub Sea asked Gary to come on a dive trip to Nantucket, and from there he was offered a place in the company. He started out as a diver and deckhand, working under past captains employed by Sub Sea. He has always had a love for boating and treasure hunting, but had never undertaken the challenge of going for his Captain’s license up to that point. In 2008, Sub Sea Research purchased the M/V Sea Hunter from a company in Houma, Louisiana. Gary was put in charge of running this ship, since he had been with the company the longest of any other crew members at that time. He was eager to get his license and bring his boating skills up to the next level. The first license he acquired was what is called the “6 PAK”, a certification stating that the captain is fit to man a boat with up to 6 passengers onboard. He then moved up to the next level over the following year, a 100 ton license that would allow him to captain a 100 ton vessel with unlimited passengers. He now has his 200 ton license and is currently working toward his 500 ton license. Building the sea time for each of these levels is the biggest challenge, since a certain amount of hours needs to be accrued before he can move up to the next license. The 500 ton license takes about 3 years of sea time to acquire, roughly. Gary’s favorite part of being employed by Sub Sea is going out on the ocean. He doesn’t mind if the sea is rough or stormy – he just enjoys being out on the open ocean. The hardest part in his eyes is waiting at the dock for the weather to cooperate. Gary is the Sea Hunter’s resident “weatherman”. He is always checking the weather and learning new things to help him predict what the weather will be out to sea. This is very useful, particularly when dealing with the current wreck project, the Port Nicholson (which Gary says has been the biggest challenge he’s faced in Sub Sea so far). As we have learned in previous articles, the weather can make recovery a very tedious process. Gary finds that the things he’s learned have helped him plan out appropriate weather windows with more skill and accuracy. Being employed by the company for 14 years, Gary has seen many things alongside the rest of the crew. One of the most interesting experiences he’s had so far is the trip to Haiti in February 2010. He said they ran into many storms on the way down, since the North Atlantic is very rough at that time of year. They were stuck in Delaware Bay for two days because of the weather, and Gary believes he was awake for four days straight that week in an attempt to ensure his crew’s safety. This is part of his job – it is up to him to make sure everything goes smoothly. He is in charge of scheduling out watches for the crew, and making the plan for each trip to the wreck site. He plots out the direction they will take and watches the weather to ensure their trip will be safe. In some ways, he is a supervisor aboard the ship, making sure that everyone does their assigned tasks so that the entire trip will go smoothly. Gary is very optimistic about the Port Nicholson recovery, and is excited to continue working through the winter to bring it up. He is willing to do whatever it takes, and make sure his crew is motivated to make that happen.